A 46-year-old man from Honduras presented to a Bronx, New York clinic with three months of weight loss, nausea, vomiting and difficulty eating and drinking. Work up included a CT scan of the abdomen which showed a gastric mass causing gastric outlet syndrome and several small perigastric nodes. Biopsy revealed a poorly differentiated adenocarcinoma of the stomach. Endoscopic ultrasound showed the tumor to be T3Nx. Perigastric nodes could not be sampled by EUS because of their small size. Treatment intent was curative and he was started on neoadjuvant chemotherapy. 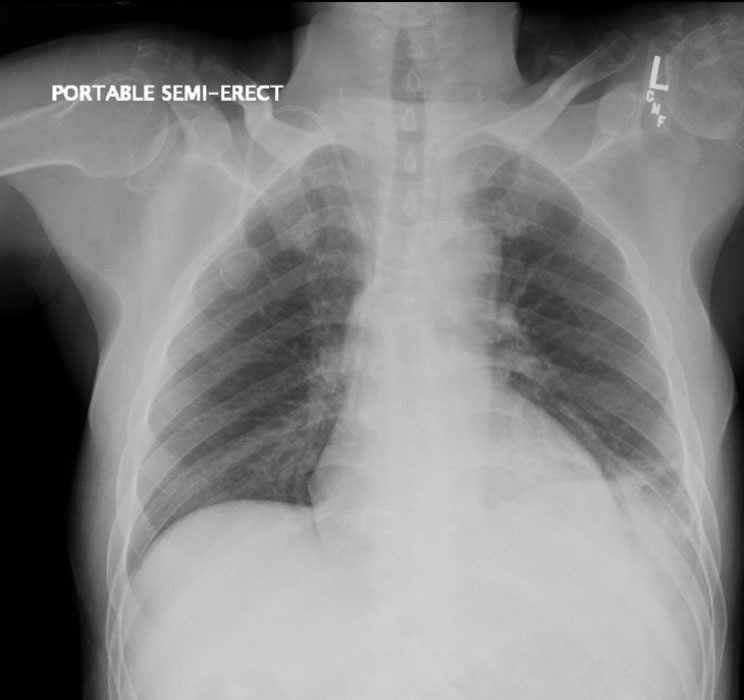 At the time of his staging, a chest x-ray (figure 1) was normal. 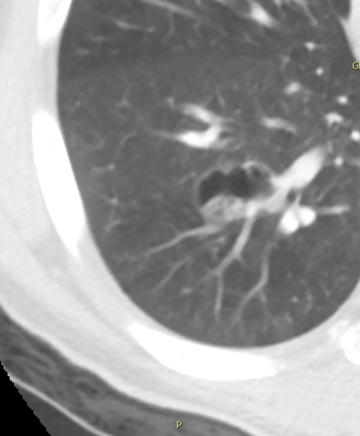 A chest CT showed a small cyst in the right lower lobe measuring 1.6 cm and small tree in bud opacity and nodule in the inferior middle lobe. The patient worked in a butcher shop, did not smoke or use intravenous drugs. He did admit to alcohol use. He was HIV negative. His symptoms initially improved on therapy but then recurred requiring a gastric stent. 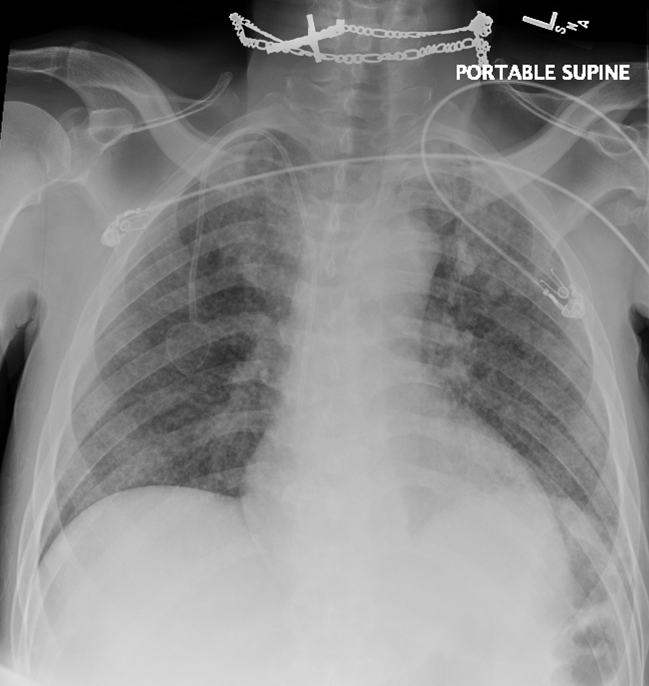 A repeat chest X-ray and CT showed consolidations at the left base with a new 8mm upper lobe nodule (figure 2). Sputum AFB stains were negative but grew Mycobacterium avium on culture. As he appeared to have progression with new mediastinal lymph nodes he was scheduled for an endobronchial ultrasound with fine needle aspirate which could not be done secondary to insurance issues. He was started on palliative chemotherapy. The patient continued to have difficulty eating with weight loss, requiring a PEG tube. He was tired but able to ambulate. He denied any cough or fever. 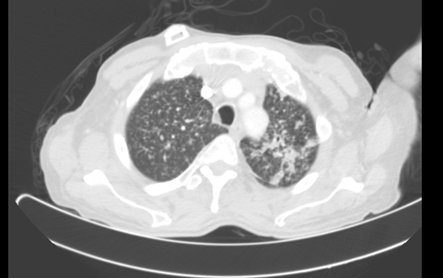 A repeat chest CT eight months after his initial presentation (figure 3) showed numerous small nodules interpreted as progression of metastatic disease. Palliative chemotherapy was discontinued and he was on supportive care. Two months later, he continued to deteriorate. Repeat chest x-ray and chest CT were notable for an increased number of nodules (figure 4). The patient died four days after these images. Sputum obtained just before his death was AFB smear positive and grew Mycobacterium tuberculosis (TB). 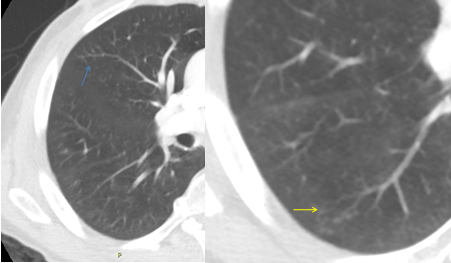 It is difficult to differentiate on imaging, metastatic cancer involving the lung and miliary active tuberculosis. This patient most likely reactivated dormant foci of TB secondary to his immunosuppression –gastric cancer, chemotherapy, or weight loss. Although his gastric cancer was poorly responsive to chemotherapy, his tuberculosis contributed to his demise. Guidelines for latent tuberculosis screening focus on two groups of patients. The first group are patients at increased risk of tuberculosis infection: close contact with someone with active tuberculosis, conversion of purified protein derivative (PPD) or interferon-gamma release assays (IGRA) within the past 2 years, work or live in an environment with people who might have tuberculosis (ex: hospitals), and recent immigrants from high risk countries. The second group focuses on individuals at high risk of developing active tuberculosis: HIV positive, substance use, evidence of past tuberculosis on chest x-ray, underweight, or immune compromised individuals such as those with on prolonged steroid use, poorly controlled diabetes, silicosis, chronic renal failure, patients undergoing gastrectomy or jejuno-ileal bypass, and patients on immunosuppressive therapy. The category of patients on “immunosuppressive therapy” has broadened over the last couple of years as newer and more powerful immunosuppressive agents are becoming available. Higher incidence of tuberculosis has been described in patients receiving TNF alpha antagonists, in patients undergoing organ transplant, patients with head and neck tumors, lung cancer, and in patients with leukemia and lymphomas. The guidelines were updated to reflect these changes [1-2]. These guidelines do not specifically address the question of screening patients with solid tumors who are undergoing chemotherapy. Do these patients have a higher incidence of developing active tuberculosis compared to the general population? Review of the literature yielded several retrospective studies reviewing culture positive patients for TB to determine if the incidence of TB was higher in this group compared to the general population [3-9]. In addition to these reviews, two other studies extracted data from TB and cancer registry to determine if TB occurs more commonly in cancer patients [10-11]. All these studies show that patients with cancer have a higher rate of tuberculosis than the general population. In the registry study from Denmark  from 1978 to 2011, the number of observed cancer in patients with tuberculosis divided by the expected number of cancer in the general population was 1.29 and even higher for patients with lung cancer 3.40. In the review of cancer patients with active TB from South Korea , the incidence rate ratio (SIR) was 4.69 in patients with tuberculosis and cancer compared with cancer patients without tuberculosis. In New York and Texas the incidence of TB in cancer patients has decreased over time. In New York from 1950 to 1971 the incidence of TB in cancer patients was 300 per 100,000 persons which decreased to 90 cases/100,000 persons in the study from Texas in 1989-1994, and further decreased to 55 cases per 100,000 persons In New York from 1980-20045. This rate is higher than the incidence of TB in the general population (estimated as a high of 51 cases/100,000 in 1992 which decreased to 13 cases/100,000 in 2004) . Overall many cases of tuberculosis were diagnosed at the time of cancer diagnosis and the most common location for tuberculosis was pulmonary. The increased rate of tuberculosis in cancer patients is seen not only in the head and neck or lung cancers but also in other types of solid organ tumors. Both population based studies [10-11] showed an elevated standardized incidence rate (SIR) of tuberculosis in patients with non-pulmonary tumors 1.71 in Taiwan (2000-2010) and 1.29 in Denmark (1978-2011). Both studies show high SIR for esophageal cancer (3.36, 2.16), liver cancer (1.84, 3.79), colon and rectal (1.4, 1.3) and stomach (1.35, 1.45). The SIR for ovarian cancer was high in the Denmark study 1.70. Both studies from South Korea [6-7 ] list stomach cancer as the most common cancer in patients developing active tuberculosis responsible for 36 to 43% of all cases of TB in cancer patients. The rate was much lower in other solid tumors such as liver, colon and breast. Tuberculosis was seen in 21% of patients with solid organ tumors in a study from Egypt8 and in 71% of non-pulmonary solid organ tumors in Japan . In the earliest US studies (Sloan Kettering 1950-1971), the rate of tuberculosis was high in patients with gastric , myeloma and vulvar cancer –actually higher than in patients with head and neck tumors: 55/10,000 for gastric and myeloma, 58/10,000 in vulvar cancer compared to 51/10,000 in head and neck tumors. In subsequent studies, the incidence of tuberculosis in patients with breast cancer was 41/100,000, colorectal cancer 39/100,000 and 0/100,000 cases in patients with prostate cancer . In the US studies from New York and Texas, the incidence of tuberculosis in cancer patients was much higher in foreign born cancer patients than in the US population. In the New York study, the rate of tuberculosis in in cancer patients was 55 cases per 100,000 cancer patients; this decreased to 33/100,000 in the US born cancer patients but increased to 126/100,000 in foreign born patients . This observation also held true in patients with solid tumors: (excluding lung and head and neck), foreign born patients had much higher incidence of tuberculosis than US born patients– 100 vs 24/100,000 (p< 0.0001) . Part of the difficulty in issuing recommendation for screening patients for tuberculosis is the poor predictive value of the existing screening process (PPD and IGRA) especially in patients with underlying immunosuppression from their tuberculosis, their cancer, or medications. However the studies consistently show a higher rate of tuberculosis in patients with underlying cancers than in the general population. Furthermore in the US studies, the rate of tuberculosis is significantly higher in patients who are born outside of the US. 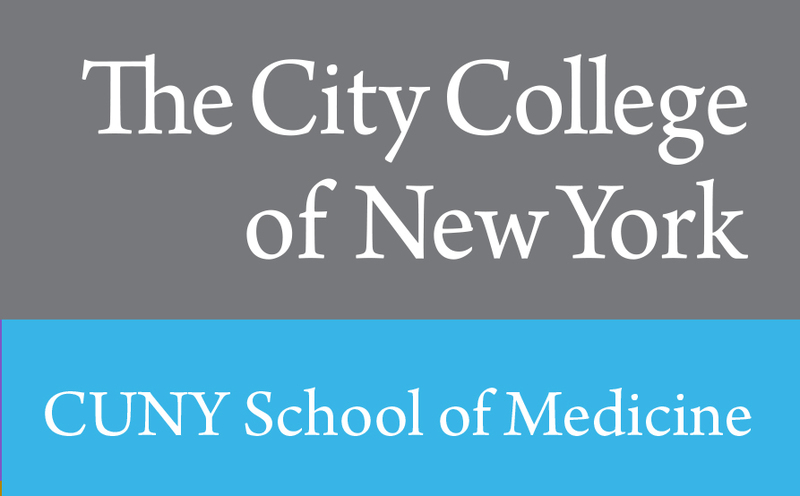 The CDC and New York City Department of Health have already included screening for latent TB in patients with lung, head and neck or hematologic malignancies. Yet there is evidence that other solid tumor patients could also be at risk (like those with gastric cancer) while others have lower risk. In the US, the risk seems to be much higher in foreign born patients (especially from countries with high prevalence of TB like Honduras). Our patient was from Honduras with stomach cancer, does he belong to a risk group worth screening? 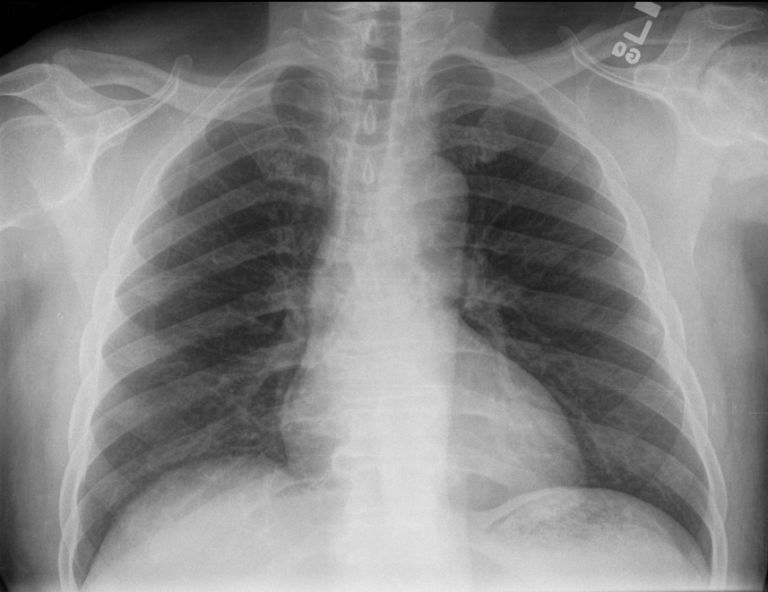 Figure 1: Chest X-ray at diagnosis of gastric cancer. Normal X-ray. 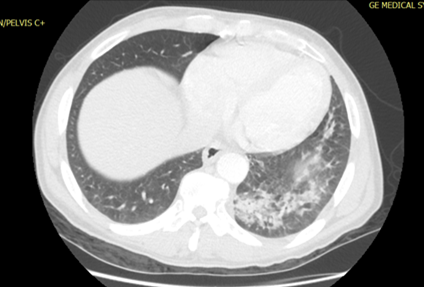 Figure 3: CT 8 months after initial presentation. 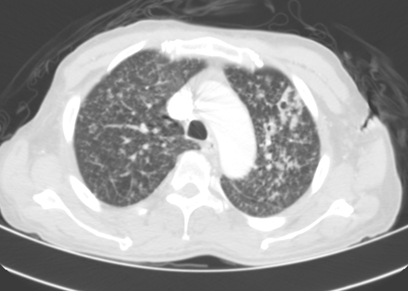 Pulmonary nodules with random distribution. More consolidative appearance at left apex. Figure 4B: Increasing size and numbers of nodules, some with cavitary appearance. Findings consistent with tubercu- losis, fungal infection, septic emboli or metastatic cancer. https://www1.nyc.gov/assets/doh/downloads/pdf/tb/tb-manual-section10.pdf New York City Department of Health and Mental Hygiene. 173. Section X. Testing for Latent Tuberculosis Infection. Tuberculosis Clinical Policies and Protocols, 4th Edition 2008. Targeted tuberculin testing and treatment of latent tuberculosis infection. Am J Respir Crit Care Med. 2000;161(4 Pt 2):S221-47. Kaplan MH, Armstrong D, Rosen P. Tuberculosis complicating neoplastic disease: A review of 201 cases. Cancer 1974; 33:850-858. De La Rosa GR, Jacobson KL, Rolston KV, Raad II, Kontoyiannis DP, Safdar A. Mycobacterium tuberculosis at a comprehensive cancer center: active disease in patients with underlying malignancy during 1990-2000. Clin Microbiol Infect 2004;10:749-752. Kamboj M, Sepkowitz KA. The risk of tuberculosis in patients with cancer. Clin Infect Dis 2006;42:1592-1595. Kim DK, Lee SW, Yoo CG, Kim YW, Han SK, Shim YS, et al. Clinical characteristics and treatment responses of tuberculosis in patients with malignancy receiving anticancer chemotherapy. Chest 2005;128:2218-2222. Kim HR, Hwang SS, Ro YK, Jeon CH, Ha DY, Park SJ, et al. Solid-organ malignancy as a risk factor for tuberculosis. Respirology 2008;13:413-419. El-Mahallawy HA, Eissa SA, Rafeh NG, Salem AES, Eissa SA, Allian SA. Tuberculosis in cancer patients: role of newer techniques in relation to conventional diagnostic methods. J Advanced Research 2010;1:157-162. Fujita T, Endo M, Gu Y, Sato T, Ohmagari N. Mycobacterial tuberculosis infection in cancer patients at a tertiary care cancer center in Japan. J Infect Chemother 2014;20:213-216. Simonsen DF, Farkas DK, Søgaard M, Horsburgh CR, Sørensen HT, Thomsen RW. Tuberculosis and risk of cancer: a Danish nationwide cohort study. International J of Tuberculosis and Lung Disease 2014;10:1211-1219. Kuo SC, Hu YW, Liu CJ, Lee YT, Chen YT, Chen TL, et al. Association between tuberculosis infections and non-pulmonary malignancies: a nationwide population-based study. Br J Cancer 2013;109:229-234.